We know each other since some years now. And I am very very pleased to see, that we finally could make it happen to have him speaking at JavaLand as a Keynoter. And what would be better for a JVM veteran than talking about this years anniversary: Happy Birthday Java! Thank you Marcus, for taking the time! I am looking forward to a beer or two at JavaLand! 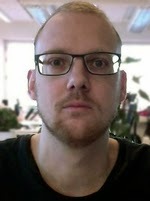 Follow his rumblings about dynamic languages on the JVM and surgeries on Twitter @lagergren. But it's obviously best to see him live on stage at JavaLand! So, if you haven't go ahead and register! Marcus has worked with Java since 1995 and with runtimes since 1999. He started out with JVMs as one of the founders of Appeal Virtual Machines, the company that created the JRockit JVM. His JavaLand keynote will be a historical trip down memory lane - going through 20 years of Java and JVM implementations. This will be partly from Marcuss own perspective as one of the architects behind JRockit, with plenty of stories from the trenches, like the benchmarking competitions between BEA/Oracle, Sun and IBM. We will see how Java and the JVM turned into the robust high performance server side platform that it is today, partly through personal observations and partly through a more objective what a long strange trip this has been. He will take you back to 1995 in a time machine and slowly bring you to 2014, going over the major Java releases and the runtime innovations made in the JVM side to get us here. Finally, we will do a short trip into the future, even though the future is always fuzzy, to explore what might be coming next. With Java 8, the biggest release in Java history, Java is more vibrant and alive than ever before. This is an evolution that wont be stopped. Question: "20 Years of Java. Wow! How long do you know Java? And I know, you've been writing the JRockit JVM back in the days .. does writing a JVM actually means knowing the language it is written for? The JVM is written in C/C++, correct?" Answer: "I first started working with Java when I was a research intern at Ericsson Medialab in 1995-1996. This was Java 1.0 and its betas. Back in those days the JDK fit on one floppy. Yes. Floppy. We had those then. I first started working with runtimes in 1998-1999, when I joined Appeal Virtual Machines on the JRockit project. The JVM is written in C++ (and metaprogrammed in Java, and with some hardcoded assembly for different silicons). Java is also a bit different from, say, C, because it has such a large API library in the JDK. I need an IDE when I program Java to remember what all the library functions are called, and get auto completion and so on. Otherwise, I'm an Emacs dude. So, I wouldn't call myself a Java expert, at least not on the libraries, but I get stuff done. Especially these last three years when the majority of my programming time has been in Java for the first time in my life. Usually, when I have a Java question in my job, I ask someone else in the Java language team, often my poor colleague Joel Borggren-Franck. When it comes to C, it's my native language, so there, you won't catch me off guard with anything. When it comes to C++, I don't think anyone fully knows that horror. Not even Bjarne Stroustrup. It's rapidly turning into a Frankenstein’s monster pseudo-runtime language as well, so I hope it will be put out of its misery soon." Q: "What is your favorite memory about Java? Did you ever meet James Gosling and won an argument against him? Or something else unknown and funny?" A: "I have indeed met Gosling several times, but I've never had a chance to have a deep, long conversation with him. Usually, we agree on what small issues we have discussed. comperssed references. That was an awesome moment. I actually remember that being met with some hostility by some people from Sun then, who were bad sports. But usually, we had a great time and lots of great conversation with our competitors. Q: "Looking at JVM technology today compared with the JRockit beginnings: If I'd ask you to name the most significant changes in a couple of sentences, how would that look like?" revolutionary feature... ever... I think. " Q: "I think it is safe to assume, that working in the language team at Oracle is one of the most amazing places. Surrounded by extremely smart people working on the future of what so many people use on a daily base. Do you personally feel this as pressure?" A: "No I don't. I feel that it's an asset, and it's the main benefit of my job and the reason that I love it.. There is always someone around who is smarter than me that I can ask for help, and the team I am on is so senior that it's virtually self managing. There is no doubt as to what I should do when I sit down at my desk in the morning, and the competence level of the engineers turns everything into a well oiled machine. I am very blessed to be in such an environment. colleagues, and I love that. Picturing myself as, say, a web frontend consultant, always makes me shudder. (Disclaimer: I don't have anything against web frontend consultants, or think they are stupid - I just don't think I'd get to solve complex algorithmic problems every day there, which is what I live and breathe for)." Q: "What are you looking forward for in this year of celebrating the 20 year success story?"